The Primetime Emmy Awards Ceremony was on Sunday, September 23, 2012. On that event, Jimmy Kimmel poked Mitt Romney in his Emmy Monologue. “Downton Abbey is not the kind of show I would typically watch, but it gives you the sense of what it would be like to grow up in Mitt Romney’s house” (laughter from the Hollywood audience). Downton Abbey depicts the lives of the aristocratic Crawley family and their servants after the post-Edwardian-era. “Alright, there’s 40 republicans and the rest godless, liberal homosexuals. You see, that is why Kelsey Grammer didn’t come tonight.” (Kelsey Grammer, American actor and comedian, is a Republican). Do You Believe Jimmy Kimmel's Comments Were Funny Or Tasteless? 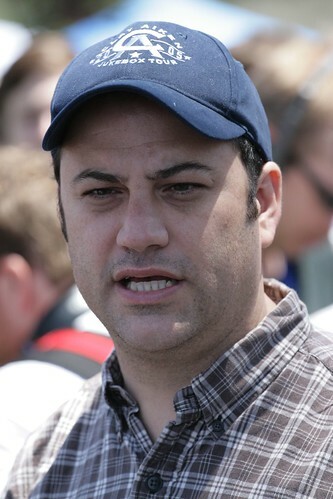 We respect Jimmy Kimmel’s openness about Hollywood’s bias towards republicans. Mr. Kimmel even openly jokes about how Hollywood believes republicans view liberals, as “godless, liberal homosexuals.” As absurd as this stereotype is, Hollywood believes it. Perhaps, Mr. Kimmel, you can draw a joke from the list that Americans, including republicans and democrats, really worry about. Some records under President Obama. Yes, Obama inherited an economy in recession. His policies, however, have only made things worse. He has had almost four years to improve the economy, two years of which the Democrats had complete control of Congress and the presidency. 5. Long-term unemployment – 45.9% of total: highest since 1930s (source). 8. Teenage unemployment 24% (Aug 2012) verses 21.4% when President Obama took office (source). 9. 81 million Americans were not in the labor force when Obama took office; 88 million Americans (Aug 2012) are now not in the labor force and are not counted in the official unemployment rate (source). 10. U.S. sovereign debt downgrade: first-time in American history (source). 11. Federal spending – 25% of GDP: highest since World War II (source). 12. Budget deficit – 10% GDP – highest since World War II (source). 13. Raised the debt ceiling to $16.2 trillion – highest in history and in the world (source). 14. President Obama’s proposed budgets spend your child into more debt than all the previous 43 U.S. presidents COMBINED. 15. President Obama will have spent 5.6 trillion dollars in 4 years – that is more money than any one has ever spent in history (source). 17. Home ownership rate – 59.7%: lowest since 1965 (source). 18. Percentage of taxpayers paying no federal income tax 47% (2011) (source). *President Obama raised the debt $5.6 trillion ($16.2 trillion debt limit – $10.6 debt the day he took office). There are 314 million Americans. $5.6 Trillion divided by 314 million Americans = $17,834.40. **President Obama increased America’s debt $5.6 trillion ($16.2 trillion debt limit – $10.6 debt the day he took office). There are 114 million American tax-filers; half pay federal income tax. $5.6 Trillion divided by 57 million Americans = $98,245.61. ***January 2009 there were 140,436,000 employed Americans; August 2012 there were 142,558,000 Americans employed. So there was a creation of 2,122,000 jobs divided by $5.6 trillion that Obama has spent = $2.6 million.